Ghosts from the past. The release of Flames Flicker by Winston Cowie on Amazon Kindle. King Tāwhiao, Rewi Maniapoto, Titokowaru, Wiremu Tamihana, Te Kooti, Prime Minister Harry Atkinson, Governor George Grey, Captain John Roberts, Ranger Gustavus Von Tempsky, and Lieutenant-Colonel Thomas McDonnell. They should all be household names in New Zealand. Sadly they are not. Today, the majority of people, New Zealanders and those abroad, don’t know who these important New Zealanders were, or what the New Zealand Land Wars of the 1860s were about. I was in the same boat (until I started writing Flames Flicker on a boat – back in 2006). Like the majority of you, I wasn’t taught the New Zealand Land Wars at school – history was restricted to learning about Tudor-Stewart England and the Treaty of Waitangi. We have forgotten from whence we came. Did you know that the warrior-priest, Te Kooti, exiled to the Chatham Islands on suspicion of being a spy, mutinied a supply ship, sailed it back to Poverty Bay, and began the East Cape Uprising? Did you know that simultaneously, on the west coast, Chief Titokowaru and the Ngā Ruahine and Ngāti Ruanui defeated British forces for a second time at Te Ngutu o te Manu in southern Taranaki? British forces were stretched. After successive defeats on both coasts and with few soldiers, after most of the 10,000 strong Imperial force that had been lured to New Zealand by the wily politician George Grey had been recalled to other parts of the Empire, New Zealand was ripe for the taking. King Tāwhiao and the Waikato Māori held the balance of power. Which of his chiefs would King Tāwhiao listen to? Would the Rewi Maniapoto faction, thirsty for war, win over the support of the King, or would he be swayed by the Christian values extolled by Wiremu Tamihana? We should all know the answer to these questions, straight off the bat – and in doing so acknowledge and celebrate the lives of the 3000 that died during the New Zealand Land Wars of the 1860s. Ordinary people. Extraordinary New Zealanders. All of them fighting, over 150 years ago now, for what they believed was best for New Zealand. In this year, 2016, the year of the 152nd anniversary of the end of the Waikato War, my New Zealand Land Wars historical fictions series is dedicated to the memory of these New Zealanders – all of those courageous men and women, both Māori and Pākehā, who helped shape New Zealand in the 1860s. Reflect on the cover of Flames Flicker, above – which has been launched as an ebook today. It’s a special cover – get to know these New Zealanders from the past that shaped New Zealand’s history. 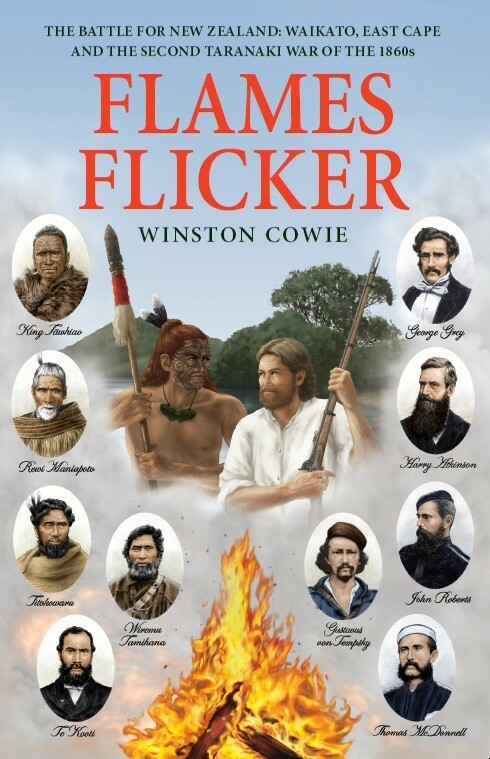 The release of Flames Flicker by Winston Cowie. Just over one year after the successful release of the ebook Greenstone Trail, the first book in the New Zealand Land Wars series (click here), Flames Flicker continues the adventures of Jack O’ Malley and Whero Pouākai as they find themselves thrown into war once again. But it’s not just any war. The future of New Zealand is at stake. King Tāwhiao and the Waikato tribes sit in the way of British settlement. Chief Titokowaru leads an uprising amongst the Taranaki tribes in the west. The warrior priest,Te Kooti, swoops from the east. King Tāwiao and the Waikato tribes hold the balance of power. Jack, with the help of the legendary Gustavus von Tempsky fights to quell the Māori rebellions at all costs. But Whero Pouākai has other ideas. He has an oath to fulfil to Papatūānuku. To booklovers in New Zealand, you can purchase one of the few original hard copies of ‘A Flame Flickers in the Darkness,’ from which the ‘Greenstone Trail’ and ‘Flames Flicker’ ebooks are based, via Fishpond by clicking here. Great for an Autumn read indoors or on the patio. A note, you have to be in New Zealand to order a hard copy. To purchase Flames Flicker on Amazon Kindle, click here. You can also read it on the iphone or ipad by downloading the Kindle Reader App for free. 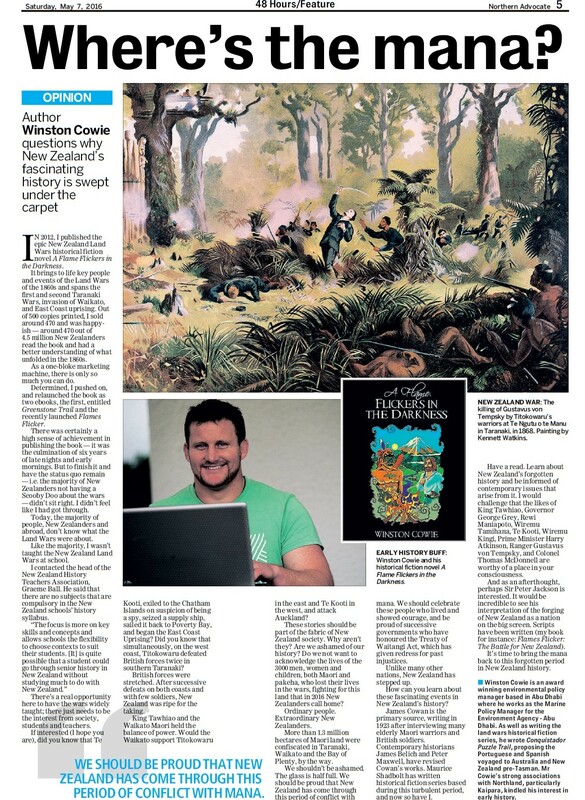 “Winston Cowie is New Zealand’s answer to Wilbur Smith! As the great-great grandson of the one the book’s main characters, I took immense pleasure in seeing New Zealand’s history come to life in A Flame Flickers in the Darkness (now ebooks Greenstone Trail and Flames Flicker). The power and mystique of the indigenous peoples battling the settlers’ rugged determination for a better life. These were men and women of their time, and Winston Cowie captured the period perfectly. The story of the New Zealand Wars is a story worth telling, especially when told as a cracking yarn! My great-great grandfather, John Roberts, a recipient of the New Zealand Cross for his actions in Taranaki, would be proud.” Sam Priest. A Great-Great Grandchild of Captain John Roberts. After reading these reviews, I sat back and considered them and ‘Flames Flicker’. It’s time for a change, I thought. At the very least the New Zealand Land Wars should be mandatory learning in New Zealand schools. I had to ask the question – are we ashamed of our history? Do we not want to acknowledge further the lives of the 3000 that died? Ordinary people. Extraordinary New Zealanders. May 2016 Update – In May 2016, I had an opinion piece published in the Northern Advocate, entitled ‘Where’s the mana’, which asked these very questions. ‘Where’s the mana?’ by Winston Cowie. Northern Advocate. May 2016. The summary is – you would be proud to read and learn about these New Zealanders, of their courage and determination, of their mana and selflessness. I researched them and wrote about them, and got to know them through writing about them. They deserve better recognition than what they have received to date. The likes of Titokowaru, Rewi Maniapoto and Gustavus Von Tempsky should receive posthumous recognition for their courage during the wars. We shouldn’t be ashamed of our history. The glass is half full. We should be proud that New Zealand has come through this period of conflict with mana. We should celebrate these people that lived, and showed courage and be proud of successive governments who have honoured the Treaty of Waitangi Act, which has given redress for past injustices. Unlike many other nations, New Zealand has stepped up, and with the support of most of the population. Have a read. Learn about New Zealand’s forgotten history and be informed of contemporary issues that arise from it. I would challenge that the likes of King Tawhiao, Governor George Grey, Rewi Maniapoto, Wiremu Tamihana, Te Kooti, Wiremu Kingi, Prime Minister Harry Atkinson, Ranger Gustavus von Tempsky, and Colonel Thomas McDonnell are worthy of a place in your consciousness. It’s time to bring the mana back to this forgotten period in New Zealand history. That’s my view for what its worth. This entry was posted in Uncategorized and tagged Maori Wars, Maori Wars novel, New Zealand authors, New Zealand historical fiction, New Zealand Land Wars, New Zealand Land Wars novel, New Zealand Wars, New Zealand Wars novel, Winston Cowie by wcowie. Bookmark the permalink.